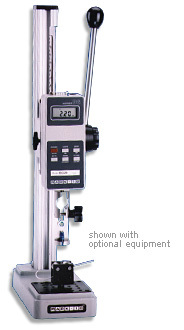 The lever operated Force Measurement Test Stand Model TSB is an economical solution for quick-action tensile testing and compression testing of up to 100 lb of force. Constructed of rugged components, this test stand is durable enough for the factory floor, yet precise enough for laboratory environments. 6" [152 mm] travel, 0.0005" [0.01 mm] resolution, SPC output for automated data collection. Requires travel stops kit.